Inspired by fellow 2015 debut, Adam Silvera, here’s a look at where my books are pieced together. I have a journal for each of my manuscripts. 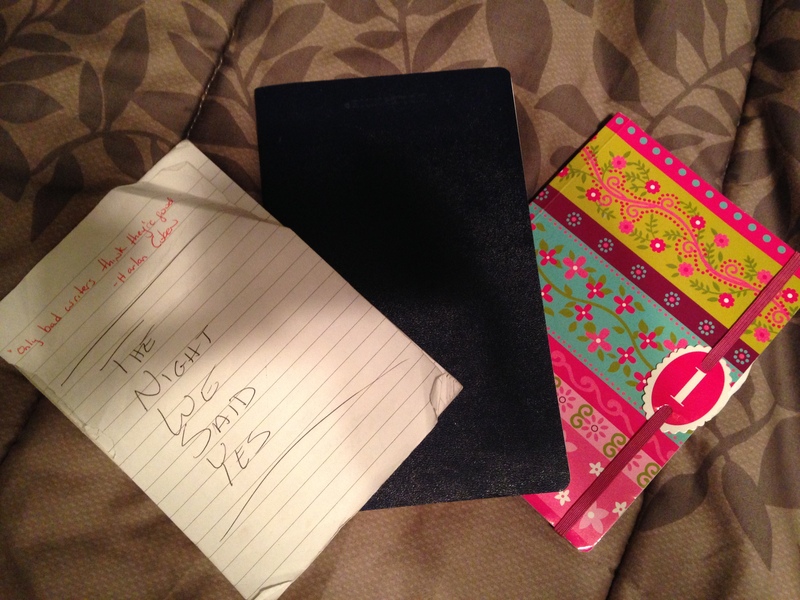 I bring them around and jot down notes/ideas/scenes as they come to me. The full book isn’t written in them (i’m a much faster typer), but they have a ton of details I like to go back and look at. On the left is, obviously, the one for TNWSY. My friend Katie got it for me because it’s circus themed. Before it tragically lost its cover, it said “reach for the sky, be adventurous,” which is kind of fitting for writing your first novel. The middle one is for my second contracted book with HarperCollins (more on that later, but yes, I have a second book set to be published-!!! !-it’s also a YA contemporary, and this one takes place in Tallahassee because I clearly only like to write about places I’ve lived in). My friend Sarah got it for me. It’s blue and thick and hasn’t lost its cover…yet. The one on the right is for something I’m currently working on. My friend Michelle got it for me, and the story is fun and sweet like her. I used a journal I bought myself once, and the manuscript fell apart. So i’ve decided to only use ones given to me, because then I associate the person with the book. And I wouldn’t want to let my friends down, right? Okay! I call gifting you your next journal! I call gifting your next journal!